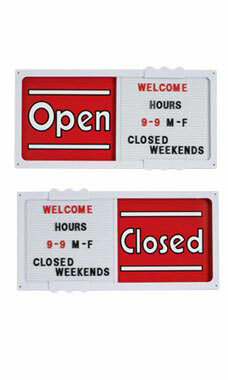 The Horizontal Open/Closed Sliding Sign Boards allow your customers, delivery personnel and mail carriers to know your store hours of operation. The sign board has an open and close panel that can be moved from one side to the other to show whether your store is opened or closed. Additional features include a white changeable message board with 180 black and 180 red upper case Helvetica font letters, numbers and symbols for you to display your hours of operations, other information and announcements.